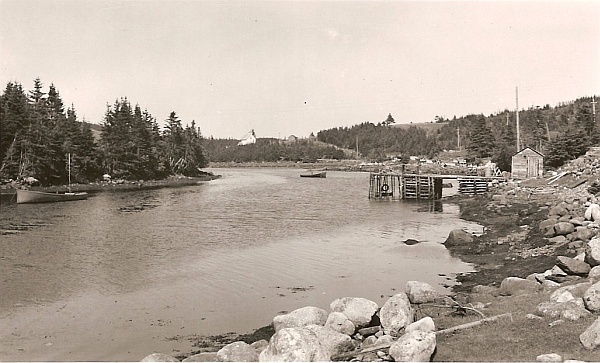 In her book “History of the County of Guysborough”, Harriett Cunningham Hart states that the first settlers of Cole Harbour were George Tanner and William West, who came here from Lunenburg, N. S. in the year 1817. The Tanner name carried on as property owners until about 1938 when my parents Winfield and Ada Myers purchased the Tanner property from Leander Tanner, grandson of George Tanner. Little else is known of William West. Legend has it that previous visitors knew of Cole Harbour, perhaps as a sheltered haven, as a Norse axe was discovered here during the 1800’s; however, its whereabouts are since unknown. The local native tribe of Mik’maq also were aware of the location, as they identified it as “Wonpaak”, meaning “still water”. George Tanner, Peter Tanner, Lewis Uloth, Edw. Harrigan, James Harrigan Sr., James Harrigan Jr., George Harrigan, James Neil, Wm. Myer, Thomas Knowland, Wm. Gammon. Most of these are later identified on the 1876 A. F. Church map of the area. Not many years later the names of Munroe, Dort, Jamieson, Grover, are noted. It is also interesting that the Acadian settlement of the Tor Bay coast in the late 19th century by-passed Cole Harbour, but settled on either side at Charlos Cove and Port Felix prior to other known settlement at Cole Harbour. A. F. Church shows both a Post Office and a School House prior to 1876. The one-room elementary school continued in service until after the late 1950’s, and even served the occasional Gr.10 student, depending on the teacher’s qualifications. The Post Office moved numerous times over the years, depending on who became postmaster. It usually was kept in the postmaster’s home or business, such as my parents kitchen. Mail would normally arrive early evening by automobile from Half Island Cove, where it had come from the Guysborough Post Office, with out-going mail in the reverse. This was commonly the social activity of the community, except for church and school. As the exact time of arrival was rather unpredictable due to weather (especially winter) and prior transportation by train and truck from Halifax, Montreal, and other points west, local residents would often arrive at the Post Office to “wait” for the mail, exchanging local news, telling stories true and false, and engaging in horseplay. The majority of goods came to the community by mail C.O.D., usually from Eatons or Simpsons mail-order stores, especially at Christmas time, creating great expectation and speculation among the younger residents. Occasionally, a family or two would have occasion to hire one of the few automobile owners in the community for a trip to Canso, Guysborough, or Antigonish, for medical, dental, or business reasons, when shopping could be done in those places in person. Transportation of supplies for the local general store as well as for individuals could also be provided by coastal Motor Vessel on a monthly basis from Halifax. A Government Wharf was provided near the harbours entrance for such general usage until the late 1900’s. During and since that time road transportation has improved so that residents more normally are able to do business directly in the larger communities. Mail delivery has evolved to a rural route system, with a regional Post Office at Larrys River. Legend also has it that during or prior to the early days, pirates or privateers has buried treasure inside the harbour entrance. My grandfather recalled that, when a small boy, a group of seamen arrived, and after digging for some time excavated a chest reportedly containing treasure, and leaving a depression in the ground beside a large granite rock to become known as “Money Rock”. Several generations later I have personally observed the site. The legend continues that the seamen were known to have built large homes (for that time) in the Tor Bay area. The economy of Cole Harbour was typical of the area, inshore fishing, sometimes alone or in partnership with another, or brothers or sons. The main catches were lobster, mackerel, herring, cod, or the occasional swordfish. Each fisherman maintained his own wharf or stage, and a fish store where catches were salted to be later dryed or barrelled, and sold at the end of the season. Generally each family kept their own milk cow, sheep, chickens, garden, hayfield, etc. to provide fresh and stored food along with the produce of the sea. Fuel for heating and cooking came from each families woodlot, and was cut during the winter when fishing could not be done, and hauled by horse or oxen to the house yard where it was sawn and split to be dried for the next season. Other winter activity consisted mainly (for the men) of repairing and/or building traps, nets, boats, and gear for the next season; and for the women, knitting wollen mittens and socks for the menfolk and children, and quilting bedding or hooking mats from used clothing to cover the cold floors. Until the early 1950’s there was no electricity available, so lighting was by kerosene lamps, except in the Capt. Myers house where a wind powered generator supplied electric lights. Food preservation was either by salting, drying, or icing (when available) until electric refrigeration became available. Running water meant a river, stream, or a family member carrying a bucket or two from the nearest spring or well on the house yard. The harbour itself is quite sheltered from the ocean and winds, and was often sought as a haven during gales and bad weather. Marine guidance to the harbour was by two range lighthouses for approach from the bay, and a single lighthouse near Dort’s wharf to guide craft into the harbour. The inner half of the harbour would freeze over during winter, and during the sailing vessel era, vessels would be anchored to “freeze-in” if they could not be hauled up on shore as were the smaller fishing boats. In the early half of the 1900’s, sport fishing for sea trout was very popular, with catches up to eleven pounds, as well as brook trout from the Cole Harbour river. One of the earlier entrepreneurs Capt. Simon Myers, and later his son Capt. Freeman Myers, maintained a large home and business at the head of the harbour, beside the river adjacent to the main road (now rte.316). To bring supplies for the business, they built a quay and slip beside the river mouth, accessible only at high tide, to accommodate a skow or barge which was towed into place from a larger vessel in deeper water. Cemeteries for both the Baptist and Anglican churches have been maintained in the respective churchyards since at least 1868 and 1896 respectively, and church services held usually on a fortnightly basis as part of a circuit of their Queensport parishes. Catholic services and burials for Cole Harbour residents were provided from the Port Felix parish. During World War II, an Air Force Radio Base was established at Cole Harbour on the Queensport Road at the high elevation of the “barrens” about a mile from the north side of the harbour. This base housed about a hundred airmen for several years until the war was over, and was later torn down. While there, they somewhat added to the social life of the community, sometimes living off-base, and or participating in church or school activities. With the improved education availability, transportation, and fishing technology, the community relies much less on fishing, with many young people moving to more prosperous occupations and locations. Fewer residents live here than a generation or two ago, while some still own property as retirement or seasonal homes. The post office opened in Oct 1869 and was in operation until June 1969. It was usually in the residence of the postmaster.